In the Christchurch Priory churchyard, right over against the low railings separating off the pathway under the north wall, is to be found a gravestone occasioned by a particularly tragic event. 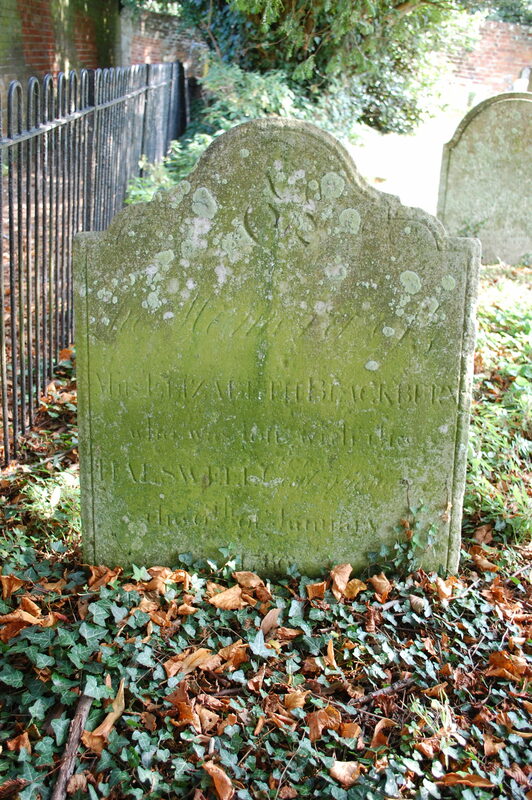 It is that of a young woman (see picture), and the inscription, still legible through the moss and lichen, reads “In memory of Elizabeth Blackburn who was lost with the HALSEWELL on the 6th January 1786”. The graves of two other named victims of this terrible shipwreck, Charles Schultz and George Webb, are nearby. These were but a few of the 168 victims, passengers and crew, of the sinking of the East Indiaman “Halsewell”, on the Purbeck coast on the 6th January 1786. The Halsewell, with Captain Richard Pierce in command, set sail from the Thames for Bombay, its third such voyage to India, on 1st January 1786, with 242 passengers and crew, a very considerable number for any merchantman at that time, and a large cargo, mainly of furniture, destined no doubt for the officials and employees of the East India Company. On the 4th January, as they emerged through the Straits of Dover, they met a terrible storm and blizzard. The severity of the storm increased as they made their way down the Channel and the ship sprang a leak and started to take in water. 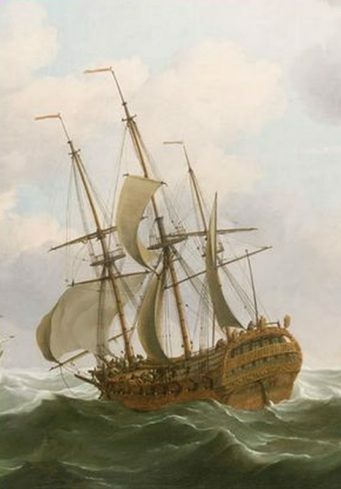 Soon the foremast with its rigging was snapped off, and when the attempt was made to cut the wreckage free and jettison it over the side, five of the crew, entangled in all the stays and halliards, were carried away and drowned. The mainmast was also lost soon afterwards, and despite efforts to jury-rig a temporary mast the ship was now being driven almost uncontrollably by the fierce hurricane force winds back up the channel, with Captain Pierce desperately hoping that he might make it back into Portsmouth for repairs. After passing Portland Bill, as they were blown back up the Channel, Captain Pierce, whose two daughters and two nieces were amongst the passengers, hoped to be able to take temporary shelter in Studland Bay. But this attempt was doomed to failure because before they could round Durlston Head the Halsewell was driven onto the rocks at Winspit on the Purbeck coast. Stuck on the rocks with huge waves pounding her, it was only a matter of time before she broke up completely. Fortunately, the ship was heeled over such that the makeshift mast was resting on a rocky ledge at the mouth of a cave at the foot of the cliff, and the more agile members of the crew and some passengers were able to scramble up it, although several were washed away in the attempt. Once on this ledge the quartermaster and the cook were able to scale the precipitously steep cliff and raise the alarm. A Mr. Garland of nearby Eastington was the first to be made aware of the tragedy, and he quickly summoned local quarrymen, equipped with ropes, to give assistance. In the cave below though, the effect of the howling blizzard on the soaked survivors meant that many, having survived the waves, died of exposure. Nonetheless the quarrymen, often putting their own lives at risk in the terrible conditions, were able to rescue 88 of those who had made it onto the rocky ledge, although 14 had perished in the process, and eventually a total of 74 were given shelter and sustenance at Eastington Farm. The shipwreck was regarded as a national tragedy; never before had so many perished from a single ship in peacetime. King George III, who had been holidaying at Weymouth, came to the scene to pay his respects, and a reward of £100, a considerable sum at the time, was given to the rescuers for their bravery. The Christchurch Priory Parish Register of Burials for 1786 shows that in the two weeks after the event no less than fourteen bodies were recovered between Poole and Christchurch and buried at the Priory, mostly in pauper’s graves if they could not be identified. One such who could be identified and buried at the Priory was Mary Pierce, the captain’s daughter, who had perished with her father, her sister and her two cousins. 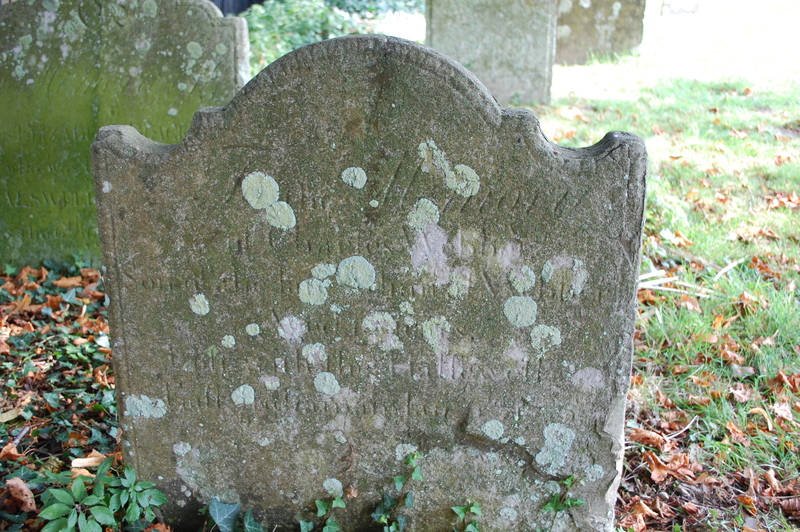 The only other victim to be buried on hallowed ground was one washed up several weeks later and buried in the churchyard of Worth Matravers parish church. The majority of the bodies of the victims that could be recovered were buried in mass graves on the cliff above the shipwreck, a fact that later caused great controversy, that so many were denied a decent Christian burial on hallowed ground. Such was the enormity of this tragedy that the public memory of it lingered for many years, indeed it was the inspiration for a painting by the famous artist JMW Turner, and much later, the novel “The Long Journey” by Charles Dickens. The charming “Square and Compass” pub in the beautiful little village of Worth Matravers has a small museum attached and amongst the local archaeological finds and fossils is a display board of items from the Halsewell, mostly brass fittings from her large cargo of pine furniture.